The Institute of Directors' Student of the Year award was introduced last year as a unique opportunity to recognise student members who have implemented brilliant and innovative projects. Students submitted their entries from all around the UK and Alain is one of six contestants shortlisted for this year's prestigious prize. Alain's shortlisted design, 'Keidas_9', is a multifunctional transportation device created as part of Alain's final-year engineering product design project. Keidas_9 can transport up to 289 litres of liquid – such as clean drinking water - over ground, as well as being able to float on water in aid of flooding. Since graduating last year, Alain's product development has been supported by LSBU's Graduate Entrepreneur Scheme. The twelve month programme helps to successfully launch graduate businesses by providing a package of mentoring, financial support and office space based at the university's Clarence Centre for Enterprise and Innovation. "Keidas_9 can be used for everyday activities such as gardening and farming," explains Alain. "However it can also be used for disaster relief to aid in times of flooding or droughts. 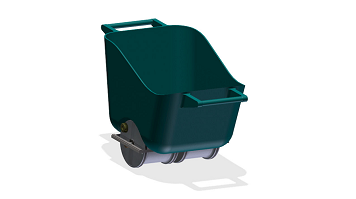 It is made of high density polyethylene (HDPE) and steel, allowing each wheel to act as a water container of up to 20 litres of liquid. "I was fortunate enough to be awarded the Social Entrepreneur Award through LSBU for this project, which enabled me to develop it further. The past year I have gained invaluable experience with the LSBU Graduate Entrepreneur Scheme and made some really helpful contacts through the Institute of Directors Student Membership. "The next step for this project is to establish the product in the UK within the domestic and wheelbarrow market. I will then focus on expanding into the worldwide market by promoting the product as a necessity for disaster relief." The Institute of Directors is the UK's largest and oldest running organisation for professional leaders, dedicated to supporting and encouraging entrepreneurial activity and promoting responsible business practice. The winner will be announced at the IoD Director of the Year Awards Final on 24 October at the Lancaster London Hotel.